ISIS Middle-Eastern Gambit 5 out of 5 based on 5 ratings. 5 user reviews. It is now clear that ISIS leaders have begun to transfer its fighting formations to Libya and are reorienting their recruitment apparatus to attract cannon fodder for the units being formed in Libya. Thanks to the political and organizational chaos there, Islamic radicals have already begun to establish their base at the city of Sirte. From there, they exercise control over sizable territories, including the coastline. Individual ISIS formations have even begun to appear in the Benghazi area, according to witnesses. It’s doubtful this move was planned in advance. Instead, it is most likely a forced reaction to the negative strategic prospects in Iraq and Syria. There are more and more indications that ISIS has decided to transform its defeat in Syria into a strategic gambit in the continuing global struggle. ISIS did not target Libya without a reason. First of all, there’s oil in Libya. Its fields can be seized and exploited as easily as they were in Syria and Iraq. Or even more easily, since Libya lacks anything resembling a central government. It will no longer possible to sell it via Turkey, for geographic reasons, though that is not a major problem. 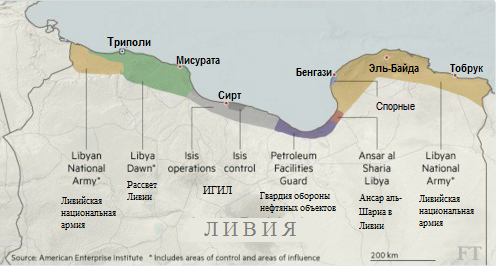 Libya borders Algeria, and Algeria is an oil exporter country. That’s even better than Turkey. ISIS smuggled oil from Libya can be easily concealed on board of Algerian oil tankers. Which means that the terrorists are about to obtain another major source of funding. The second reason is the current political fragmentation of Libya following Gaddafi’s overthrow. While Syria has a powerful army and allies such as IRGC and Hezbollah, Libya has nothing of the kind. Therefore nobody can resist ISIS. In every sense of the word. USA and NATO has already demonstrated its complete inability to organize land resistance, or even to effectively oppose the “black flags” from the air. Which means Libya represents an ideal vacuum of power which ISIS simply cannot help but occupy. According to US intelligence, there are already 6 thousand ISIS militants in Libya. They are not yet the most powerful force in the country, but at the current pace it will increase to 25-30 fighters by the end of the year. Which will change the balance of power in the country. The third factor is that Libya has nobody like Assad. Libya has two governments, which do not view each other as legitimate and which do not control even half the country. Moreover, there still exist large armed “democratic opposition” forces which are under external control and which receive foreign funding. Once again, the foreign players are Turkey, Saudi Arabia, Qatar, UK, France, and also the US. It would be rather implausible to expect that following their total defeat in Syria, these countries would want to invite Russian forces into Libya. Absent such an invitation, no Russian strikes are possible. At the same time, the situation also has a number of positive aspects for Russia. Libya borders Egypt, which views ISIS as a significant threat and whose government is already at war with it. The degree of Egyptian commitment to the fight against ISIS will only increase. Considering the recent strengthening of the Russian-Egyptian relations, and Russia’s demonstrated ability to deal with “a few serious problems” in Syria, Russia has every chance to receive an invitation from Egypt’s legitimate government to provide military and technical assistance to deal with the ISIS threat to Egypt. There are a number of possible scenarios here. Naturally, ISIS will not stop until it takes over all of Libya. Unless the remnants of the quasi-legitimate local governments do not turn for help to, for example, Egypt, and the Russian military contingent located there, sooner or later ISIS will eliminate what’s left of Libya’s government and go after neighboring countries. Including Egypt, since that country controls a canal through which up to 40% of all maritime trade passes. ISIS is currently trying to assert control over as many global chokepoints as possible. This makes the Libya-Egypt armed conflict practically unavoidable. It would be more accurate to describe it as a war between Egypt and Islamist terrorists, but that does not change the heart of the matter. UN might even give a conditional approval for a “peacemaking operation in Egypt.” Perhaps even under Russian leadership. Although even without formal leadership, Russia’s role will be decisive. It’s more probable that, as in Syria, the approach will be officially bilateral, Russia plus US, but everyone understands how little depends on what the US does. if russia were to help egypt, they could afford to pay for the economic costs such as bombs and jet fuel, so it wouldnt hurt russia’s economy. and if they helped libya, maybe they could make a deal out of it for a permanent naval base at tripoli, sirte, or benghazi. One well liked person to lead Lybia is Ghaddafi’s daughter Aisha (not sure on spelling). I’ve heard she’s working to put something together but isn’t nearly the thorn that Assad has been in natos side. Im not sure where her loyalties lie but she had a child murdered by nato during a terrorist attack targeting ghaddafi. I think she was supposed to succeed Ghaddafi originally before his murder. Not sure of where it orginally appeared but I picked up on it over at fortruss for anyone interested.